Who doesn’t love a basket full of puppies? 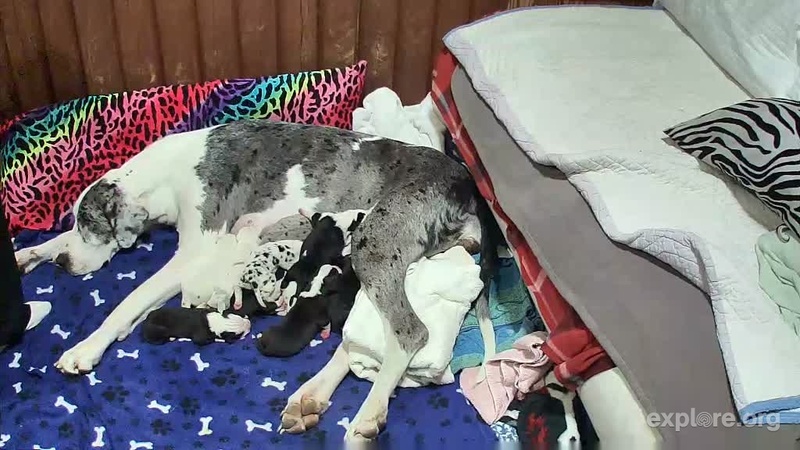 Two days ago, Scarlott, a Great Dane in the Service Dog Project out of Ipswich, MA, gave birth to eleven (11!) live puppies, and one who was stillborn. Scarlott’s puppies will eventually be placed with people who have Multiple Sclerosis, individuals with Friedreich’s ataxia, and veterans with disabilities. Each dog receives extensive training for balance, and once a dog is paired with an applicant, the dog is uniquely trained to suit the recipient’s needs. I am completely hooked on watching the litters grow up and have tuned into the Service Dog Project (and other dog breeding programs like it) for more than two or three years via their live webcam feed on http://www.explore.org. Wednesday night, when Scarlott was in the throes of puppy birth, I (and 2,400 other people) was tuned in as puppy #8 was born, unmoving. One of the volunteers worked on that puppy for more than 30 minutes and was able to save its life, much to my relief. I was literally misty eyed and could barely remove my eyes from the screen! Then, to my dismay, puppy #10 was stillborn and despite the volunteers’ best attempts, the pup could not be saved. Now, two nights on, Scarlott appears to be an able and loving mother to her eleven remaining pups. She is attentive, anxious, loving, nurturing, exhausted… all of the things you would expect a new mother to be. I wonder if she might have any memory now or in the future of the puppy who didn’t make it. We don’t know that much about the cognitive function of dogs or what role memory plays for them. If the videos of dogs welcoming home their masters and mistresses from Iraq and Afghanistan is any indication, though, it is apparent that dogs do have memory – very acute memory indeed. Zoey, my beloved Black Labrador Retriever, was one of seven puppies, and I got her when she was about 10 or 11 weeks old. I’ve often wondered if she remembers her mother or her brothers and sisters (or her father, who was named Rowdy Piper!). She certainly seems to miss me whether I’m gone for 30 minutes or a week… is that simply because I feed her and give her treats and toys? Or is there a deeper, abiding love there? I don’t know about Zoey, but there certainly is for me. I have no greater pleasure than having her in my life.